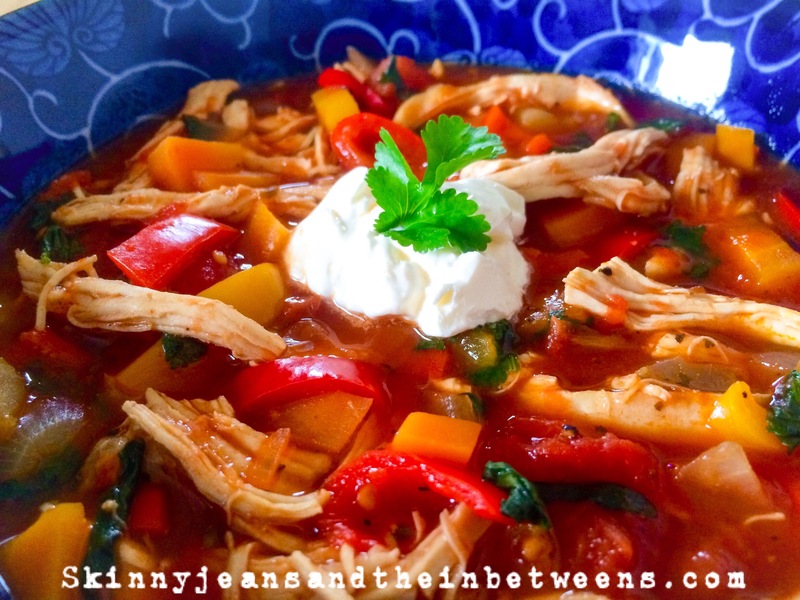 Tired of the same old homemade vegetable soup? Kick it up a notch with this spicy Mexican number! 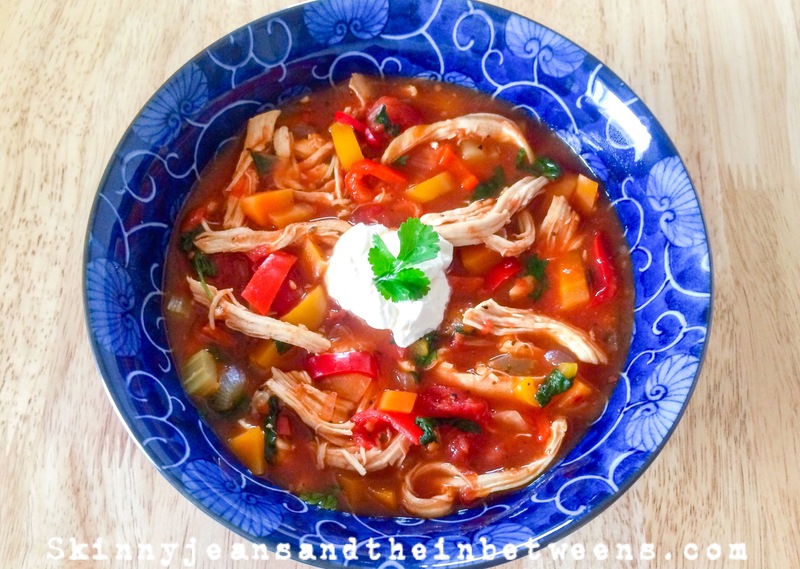 With chunky vegetables & shredded chicken this is more like a stew than a soup, a really substantial meal in itself it won’t need bread or any other accompaniments to fill you up. I’ve been having an issue on plan lately as we sometimes do & mine happens to be lunch. I usually end up over at the deli getting a wrap or something. It’s becoming detrimental not only to my food tracking due to guesstimating points but also to my pocket as it’s flippin expensive. So I’ve made a vow this week to give up this bad habit & bring my own lunches to work. 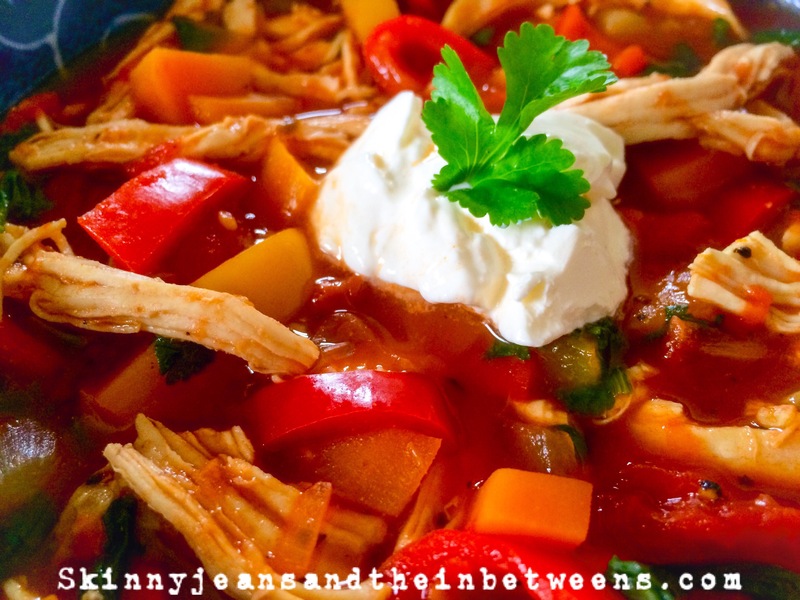 Getting myself & the baby ready & out the door in the mornings is challenge enough without throwing preparing lunch into the mix so I’m being prepared & whipping up this tasty number today that’ll see me right for a few days at least. This is totally free on the filling & healthy plan & will cost 2 propoints a serving otherwise. It yields about 4 very generous servings. Preheat your oven to 200c & roast the chicken for 25 minutes or until fully cooked through. Leave aside to cool slightly. In a large preheated pot sprayed with oil add the onion & fry for about 5 minutes. Add the carrot, celery & peppers & cook stirring occasionally until softened approximately 10 minutes or so. Crush the garlic into the pan & cook for a further minute. Add the oregano, chilli flakes, cumin, ground coriander and season with salt and pepper. Stir well & add the tomatoes (chop them through with a sharp knife while still in the can first). Pour in the stock & bring the soup to the boil. Reduce the heat & simmer for 25 minutes with a lid on. 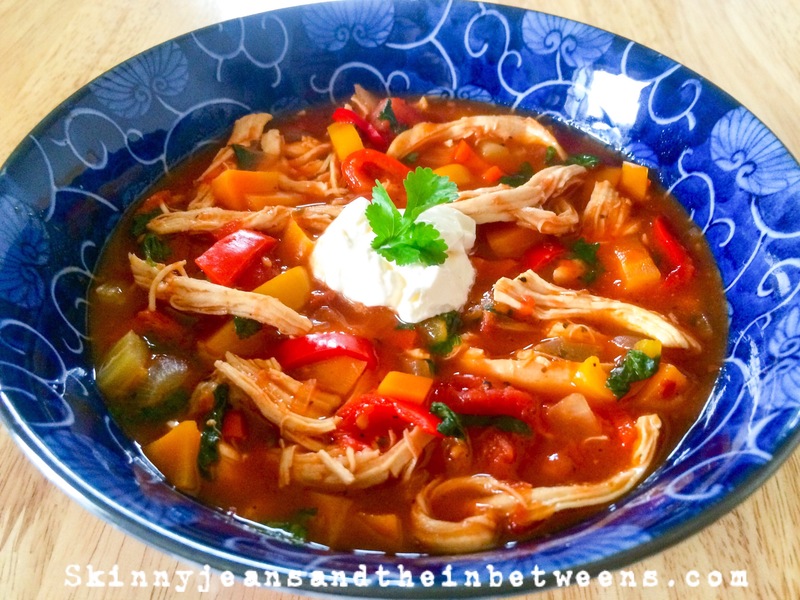 Shred the chicken using 2 forks & add to the soup 10 minutes before the end of cooking time. Just before serving add the chopped fresh coriander. Serve & enjoy!